Hey, friends! We have had LOTS of requests for this post, and I am really excited to share it with you today! Over the past few years, I’ve gone from a plant killer to a borderline-crazy plant LOVER. They really are my favorite thing about our home and what makes it feel like HOME to me. Now, some are easier to care for than others! 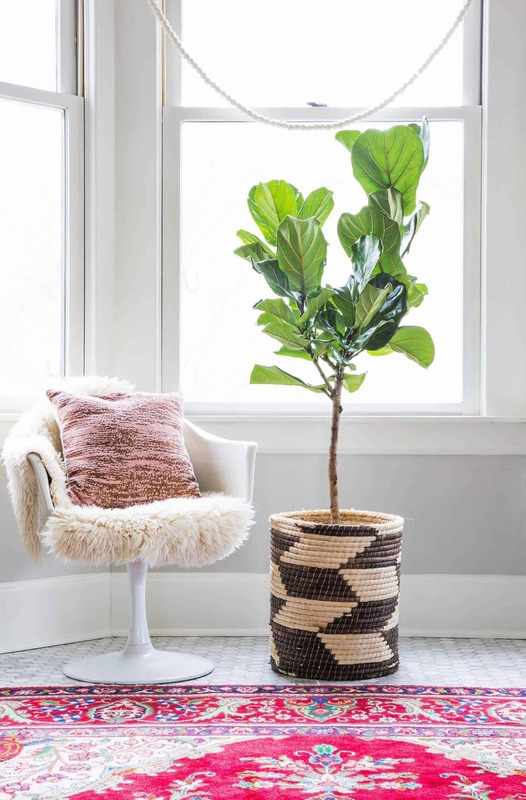 And there’s nothing worse than buying a special plant only to have it die on you when you are trying your best to care for it (I’m looking at you fiddle leaf fig trees!). So today I’ve rounded up five types of plants that are on the easier side to care for, that can live in mixed lighting and are pretty low maintenance. These are the ones that are thriving and growing like crazy in my home. 1. Philodendron – I have a lot of these in our spaces. They can live in high light, but don’t need it, and they do pretty well with my slight over-watering tendencies. They grow very large. The one above is newer, and the one below we’ve had for about six months. I also love the split-leaf philodendron. It’s slightly prettier (to me) and just as easy to care for. We have four of these in the house and the oldest one is almost TOO big. They grow really quickly. 2. Cactus – It’s no secret that I REALLY love Cacti. There are endless varieties. I am trying to buy more of the spineless ones from here on out, just to keep the house a little more safe for children (we have a LOT of kiddo house guests and visitors around here). I love the huge variety they come in! These prickly pear cacti are probably my favorite to collect. Mine have been growing REALLY well. You can see here, all the bright green pieces are new growth. They’re so pretty. There are even some varieties (not these) that can live outdoors in Tennessee through the winter. SUPER excited to plant some outside. This huge eight foot cactus is super low maintenance. I’m only supposed to water it once a month (that’s pretty normal for cacti). 3. Snake Plant – These snake plants are very easy to keep alive and work well in low light rooms. In rooms with high light (like our sunroom) they do well too, they just grow more. I love the shape they have, good for variety! A type of bonsai tree, these little guys have SO much personality and are very easy to care for. I have three in very different sizes (the mini is the cutest, though, I have to say! ), and they live in rooms with high and low light, even though they are recommended for low light. I love that their leaves look like hair. So adorable!! 5. Ivy – These are my favorite for hanging planters because they can grow really long and pretty. This one is growing like crazy in our kitchen right now. When it comes to watering and keeping them alive, here are the two tricks that help me! Water on the same day every week. My day is Sunday. We usually tidy up on that day too, so that’s the first step in that process. It’s really good to get into a consistent routine so you don’t forget about watering. When I buy new plants, I always check the tag or ask how much much to water and what kind of light, but after a while, it’s up to you to use common sense and tweak things if your plant seems unhealthy. Credits// Author and Photography: Elsie Larson, Photos edited with A Beautiful Mess actions. When they do start growing a little too big for your house, what do you do? I love this post!!! My boyfriend and I are moving in September, and I want to invest in some plants to decorate and bring some life to the new place! I’ll definitely be referring back to this post – thank you! I’m obsessed with house plants as well, every since my Mom showed me how to properly care for them, haha. So far I have about 5-6 varieties of plants indoors and on my patio. This post was so useful – this weekend I’m going to go get a snake plant and a philodendron. I love those two! Great post! I am kind of famous for my black thumb but cacti have started to save my reputation! I also have a ponytail palm and it’s the heartiest plant ever. It sits in a room with almost no light and I almost never water it and it’s five years old! BAMBOO! Grows as big as the pot it sits in and is super easy to take care of. Also survives in a hot environment inside, like Florida with the AC off. Wrapping them in a blanket with duck tape for a big one! So fun!! Have fun planning your new space Ashley! How do you keep them safe from your dogs? I have a very active puppy that it will probably eat them all!! Now that’s something useful for me, I always have difficulties keeping my plants alive. Thanks for sharing! My dogs have never tried to eat our plants. But I would probably move them higher if I were you! I love houseplants! But I’m a houseplant murderer. 🙁 I had a beautiful snake plant in my stairwell (low light) that completely died on me. They are supposed to be hard to kill and I did it! So, now I’m into finding the best fake ones I can until we move to a place that allow for more light. Loved this post! Love this post, I definitely need to add some greenery to my house! Any suggestions on where to get planters? The big box stores don’t seem to have a great selection. i love the white geometric one you have. Yes agree with Evelyn- would love to know where you buy all your planters and small white containers! anyway very informative post! I’m about to head out for some ivy now! That ivy in the last picture is so pretty! Do you remember what it’s called? Thanks! I’m going cactus shopping this weekend! To go with my beautiful little succulent babies,fingers have gotten very green this year! Love these! I have a few plants in my house and want to transfer the pots. Your pots are so stylish, where did you get them? All of them are very adaptable and pretty, as well as low maintenance. My biggest failure, on the other hand, is peace lily. Supposedly one of the easiest to care for, but somehow I cannot find a common language with mine 🙂 Living in the desert doesn’t help, but still, for some reason the plant hates me. Love the suggestions – a snake plant was my first house plant and the only thing I’ve been able to keep alive – it’s going on 2 years now! It’s also worth noting that philodendrons are toxic to cats & dogs. I wanted one so bad, and although my cat used to ignore all the plants, she’s recently taken to chomping at them. We also have a puppy that will bite at anything. So, no phil’s for us. thanks so much for the info!!! I am SO glad my dogs don’t eat plants. I love houseplants! The last one is not ivy btw, it’s called satin pothos (or silver vine). Such a great post! I am terrible at maintaining plants but I love having them around. I’ve been struggling to keep some inherited plants happy. I’m doing well with the snake plant and jade, though. But my recent purchase a eucalyptus, hates me. I will try a couple of the ones you mentioned next. Fingers crossed! Great post! The most low maintenance plant that I’ve ever had that survived years of neglect was an aloe plant. lol. These are definitely much prettier than that, though. I’m going to have to try one of these for this empty corner in my room. Thanks for sharing! Aloe is another pretty easy houseplant to keep up with, and makes for a great emergency moisturizer. Just be careful readers who are dog owners that like to chew things – many houseplants are toxic to dogs. We are unable to keep many houseplants floor-level thanks to a chewing doggie! ASPCA has a great list on their site of toxic plants for reference! This is so great! Thanks for sharing, Elsie! Do you have a go-to or favorite place to buy plants? I never seem to have much luck when shopping around. Just a wprd to the wise, be careful about what kind of house plants you buy if you have a cat or pup, some plants can be toxic to them. Great post and beautiful plants. Snake plants and ivy (spider plant, peace lilly and loads more) also help remove toxins from the air in your home too so win win, pretty and useful! BEautiful pictures! I can not keep plants alive for the life of me. Cacti are my favorite houseplant! I live in Texas, so it gets really hot here and they grow very well. They’re one of the few low maintenance house plants that aren’t toxic to cats. You have no idea how much I needed this post! I have been killing plants left and right in my low light apartment and needed some suggestions, thank you! I buy a lot from home depot and lowes. My favorite local shops are Hewitt and Garden’s Of Babylon if you are from Nashville area. I honestly have a lot of luck at Home Depot and Lowes (even Walmart!) and my favorite local shops are Hewitt and Garden’s Of Babylon (I get the more rare ones and bigger cacti there). I’ve bought a few on eBay as well! I’m obsessed with the variety of planters you have! I know you’ve done posts about planters in the past, but I would love maybe an updated one or just something about the ones you! Are your animals very interested in any of the plants? I used to have a ponytail palm but my cat liked to chew it and it would make her vomit. I love plants but I always try to look them up to make sure they aren’t toxic for my fur babes. If you all did a “pet friendly plant guide” I would soooo appreciate it! I would also love to know where to find indoor planters, particularly larger ones that don’t break the bank! I am also curious about how you deal with the drainage issue for indoor plants…if it has drainage without a matching catch tray what would you do or if it doesn’t have drainage is there a special way you plant in it or does it not harm your plants? I LOVE your pots. I’m always on the search for a good pot. It really adds to the aesthetic. What a great list! I’d love to see Laura do one of cat friendly plants — so many easy to grow plants aren’t good to have around curious kitties. I think it’s a silver satin pothos. Super easy to grow! Golden pathos. Only plant I can keep alive. It’s actually not ivy, it’s a silver pothos! Indeed a variety of philodendron, as Amber says. They do well in medium to low light and LOVE artificial light (like in an office setting). How many times should I water my snake plant? It’s a Scindapsus pictus, but it’s commonly called a ‘Satin Pothos’ or ‘Silver Philodendron’. ? So fun to see all your plants! The larger ‘cacti’ in this post is actually a Euphorbia, which is worth noting because all Euphorbia have a milky latex sap that is toxic and highly irritating to skin and eyes for both people and pets. Power to the plant ladies! ???? Such a great post! I love the philodendron but never knew what it’s proper name was, thanks! Your plants are beautiful. That last guy is a satin pothos though not an ivy in case anybody’s looking for one. I only have a small cacti, but I’m really hoping it takes it’s sweet time to grow, as I don’t exactly have the room for it, if it decides to have a growth spurt anytime soon! I have had neither skill or luck even cacti and ivy. Time to try again. I love this post! Like others, I would love to hear about your containers (including notes about drain holes, covering with moss or gravel, etc). I wanted to add that I’ve spent lots of money on plants and almost nothing on plants–you can go either way. Aldi (yes, the grocery store) occasionally sells plants, and I have done really well there. The plants they sell are typically small, but it’s very rewarding to grow them. I have a croton I bought there a few years ago that is huge now. I recently replanted it in a black plastic pot (12″ diameter) I bought at Walmart for $4. At Walmart I purchased a little black plant stand for $3, also, that lifts it right in front of the window.The most expensive part of re-potting it was the soil! Target also has some nice inexpensive pots. I have trying to have houseplants so bad, but I am terrible with them! I bought ivy not too long ago because I read they were easy to care for. However, both of mine died 🙁 I tried them in different rooms (the sun room, bathroom, kitchen) but no matter what they just kept dying. I watered them consistently every week as you suggested but I am out of ideas. Do you know if they require a certain pot or soil mixture? Thanks for the article. Maybe I’ll try some of these other plants. Does anyone know if they are pet safe? They look so great, I might consider buy these plants for my room. Every plant I’ve had up until right have all withered on me even though I’ve given them all my lovin’! I think I’m going to start up with cacti, and then up the notch of plant care difficulty! I love Philodendron, but they grow really large. I also love White Spathiphyllums, they are gorgeous. Are any of these nontoxic for a household with cats? I’d be really interested in an easy-care, cat-safe plant list if you decide to do a follow-up! I would love to know where you get your planters! Ah great guide! Need some plants in my bedroom! I love me some houseplants! Our new home is almost ready to move into and you’re giving me some fantastic ways to “dress” indoor plants. I especially love the snake plant’s basket! Thank you for sharing. I love me a cactus, I’ve been avoiding the flowering ones though because I find I still (somehow) manage to dry them out. I’ve been trying to figure out what types of plants / flowers to buy for someone who is really into in-door(ish) gardening! This was very helpful. Nice idea for home plantation. I like it. Please keep sharing such amazing ideas with us. I recently realised after living here for nearly 5 years that we have ZERO greenery. Like, no natural oxygen at all. Who does that?! I love cacti and cactus and they would defo be my first choice (spineless)! I love ivy as well but I can imagine the chaos it would cause in our too small home already! I’m sorry this is completely off topic but I was wondering what brand your stack of plates are from or where were they purchased? I’ve been looking for these types of plates! Thank you! Additionally, that photo that you posted of your “huge eight foot cactus” isn’t actually a cactus at all, it’s a Euphorbia (a really happy Euphorbia at that!). It’s important to note that they are harmless while intact, but if you snap off any part of the plant, it will secrete a sticky, white sap that is EXTREMELY dangerous. It is caustic and will cause anything from mild-moderate irritation if it comes in contact with the skin to more extreme reactions like blindness (very easily if you rub your eyes with sap on your fingers) or even death. Not necessarily the best plant to keep indoors if you have pets or kids running around, so thought it might be worth throwing out there. Not to be a negative Nancy or anything… I love the blog!! I would LOVE to know where you got your planters also!!! Pretty please!! I have quite a few houseplants that are in desperate need of repotting but I haven’t found pots I like till I saw these! I know you posted on Snapchat but I missed it. Can you post somewhere else for me? Any suggestion for pest control? I’ve had issues with aphids. Might help to research some organic pest control – harsh-free and chemical-free for your plant and your entire home! I love DIY myself – check out my website http://dushonok.com and you might have an idea.